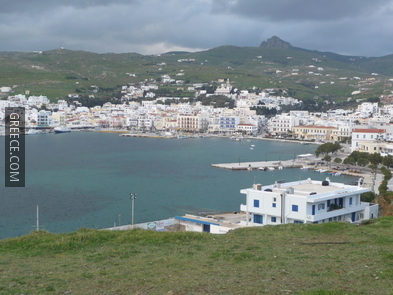 Tinos is part of the Cyclades cluster and the third biggest island after Andros and Naxos. It has a surface area of 194km² and a population of 5,203 (2001) people. The island has about 40 little picturesque villages, more than 700 churches and monasteries, immaculate dovecots and many sandy and pebble beaches. All these elements, along with the fact that the majority of tourists haven’t yet discovered it, compose a set that overwhelms you as soon as you step on the island. 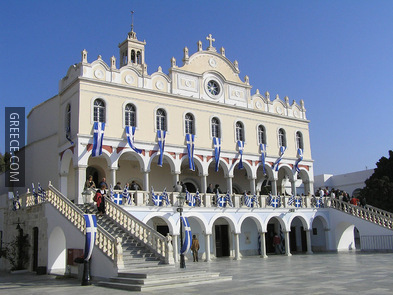 It is well known to Greeks as Tinos is regarded as one of the most important orthodox places of worship in the country. 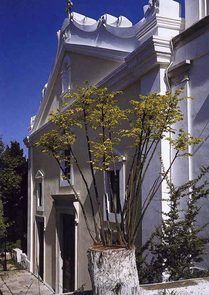 At the same time, Tinos is an important catholic center. This religious mixture, rare in Greece, gives a unique character to the island. Tinos is a very interesting place to visit. Here, you may enjoy its architecture, its picturesque villages, its beautiful beaches and its traditional culture and way of living that are present until today. It is an ideal place for those who love nature, architecture, art and traditions. 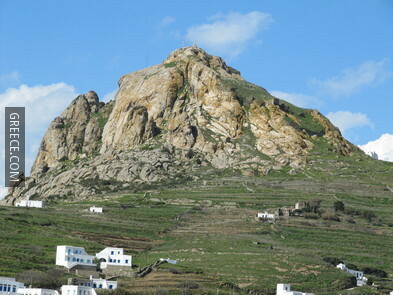 The ancient name of Tinos was Ofioussa (ofis = snake), because of the great number of snakes that lived on the island. According to mythology, Poseidon, god of sea and protector of the island, chased the snakes away. Another legend mentions that Tinos was home of Aeolus, god of winds. 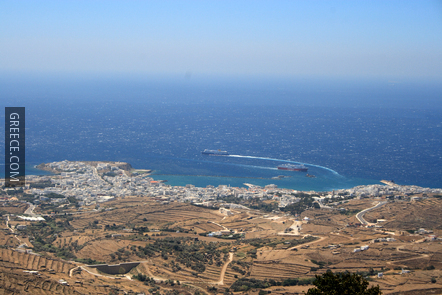 The first inhabitants of Tinos were the Phoenicians followed by the Ionians in 1000 B.C. During the Median Wars, the island came under the authority of the Persians in 490 B.C. Tinos, after regaining its freedom after the battle of Marathon, became a member of the Delian Alliance, and instituted democracy. During the Hellenistic times, Tinos, as all other Greek islands, passed to the authority of Philip of Macedonia and later the Egyptian Ptolemies, successors of Alexander the Great, son of Philip. In the 2nd century B.C., Tinos became part of the Roman, and later the Byzantine Empire. During those times, the island suffered from pirate raids and the inhabitants moved from the sea town to the interior of the island, in order to protect themselves. In April 1204, Constantinople was besieged by Frank crusades. It was then that the division of the Greek lands began, along with the rest of the Byzantine Empire. Thus, in 1207, Tinos and Mykonos were given to Venetian brothers Andreas and Jeremiah Gkyzis. 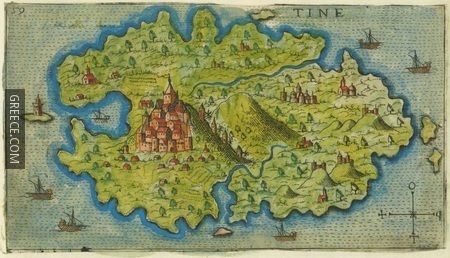 The Venetian rule of Tinos lasted longer than in other islands, because the Venetians in cooperation with the inhabitants managed to repulse the Turkish attacks for quite some time. Eventually, the Ottomans gained control of the island, but the inhabitants were granted special privileges. This period was characterized by great development. 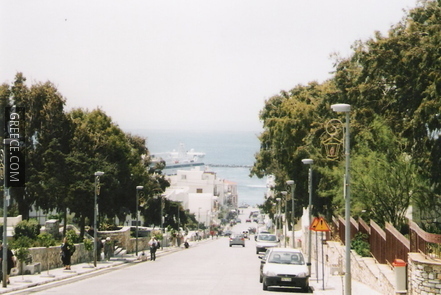 Tinos was the most populated island of the Cyclades and the economic capital of the group. The island played an important role in the preparation of the Greek Revolution, as more than 20 inhabitants were members of the revolutionary organisation “Philiki Eteria”. The island became a part of the New Greek state in 1830. 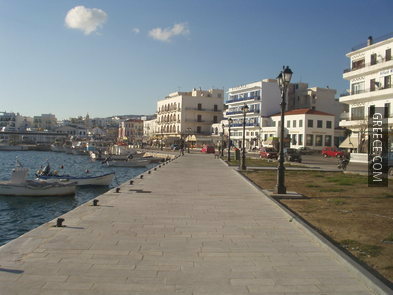 Hora – Port: The modern capital of Tinos, which locals call Hora, has enjoyed great development during the last decades. This is merely a result of the discovery of the miraculous icon of the Virgin. 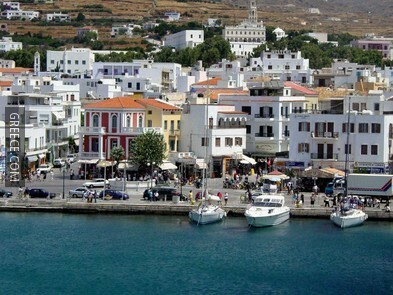 Today, three quarters of the island population live in Hora and almost all tourist activities are here. The capital is not particularly picturesque but the new white apartment buildings and three or four-storey houses are well combined with the traditional old houses. In Hora you may find everything you might need: restaurants, cafes, bars, hotels, rooms for rent, camping sites and tourist shops. 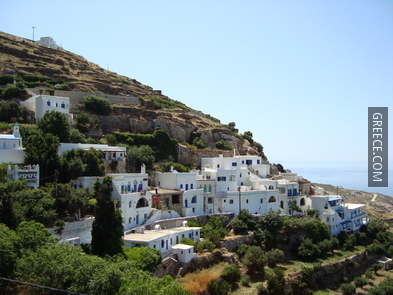 Dyo Horia: is one of the most picturesque villages of the island. It is built on a green slope with lots of cool, running waters. In the center of the village lies the main square with plane trees, bougainvilleas and an amazing view to the horizon and the neighboring islands of the central Aegean Sea. A small tavern runs in the village. Triantaros: This village has been amphitheatrically built on a mountainside among green ravines. It is a large village with rich vegetation and water springs. Many foreigners have bought houses here during the last couple years. 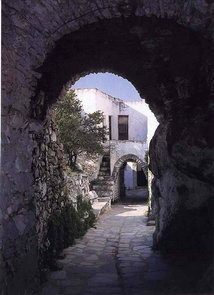 Cardiani village: is a beautiful village and certainly the greenest of Tinos. 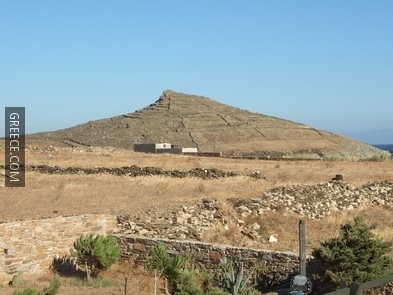 It lies on the slopes of Mountain Pateles northwest of Hora. The village was founded between 1670 and 1690 by inhabitants from other parts of the island, probably because of the plague epidemic. This explains the coexistence of Orthodox and Catholics in the village. Cardiani is most likely the prettiest village of the island and is definitely worth a visit. 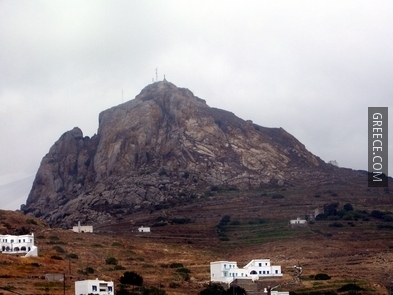 Koumaros village: is north of Hora on the northwest base of Mountain Exomvairgo. 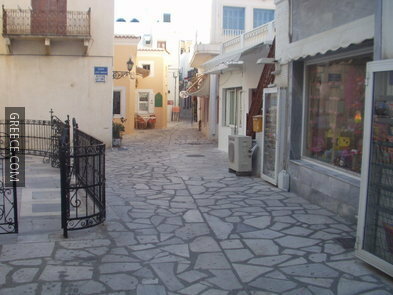 It is one of the oldest villages on the island and preserves its Cycladic style. 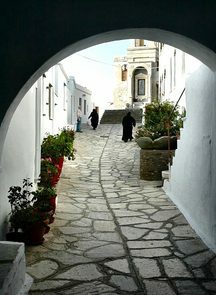 Pyrgos village: is one of the largest and most beautiful villages of Tinos. It is the oldest settlement in the area and dates back to the Middle Ages. 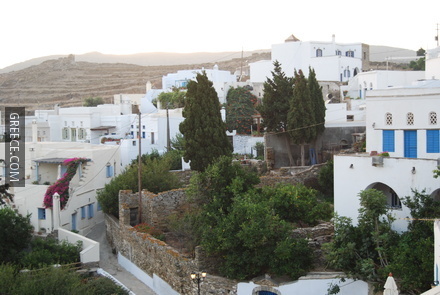 The village is called an open-air museum of immutable traditional Cycladic architecture. 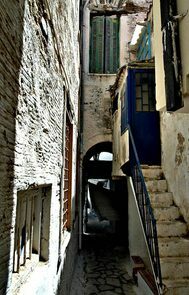 The whitewashed narrow paths, houses and churches are beautiful, matching to the white aristocratic feel of marble, giving the village a superb décor. 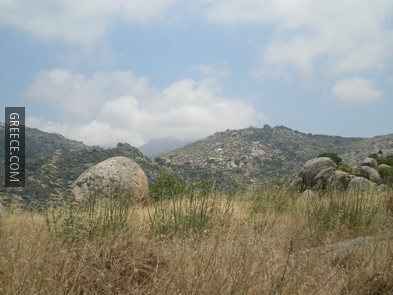 Isternia: is built on a slope of the Polemoukampos Mountain, named Meroviglia. It is an amazing natural landscape with a magnificent view. 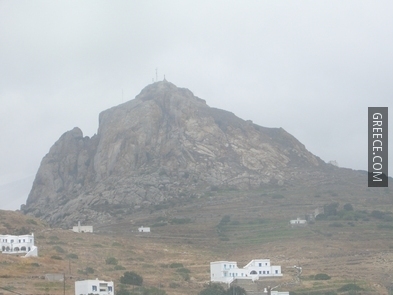 The village is one of the largest in Tinos and its history goes back thousands of years ago. 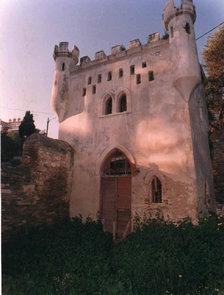 Due to the fact that Isternia is the birthplace of many prominent sculptors, the decoration of the houses is unique. 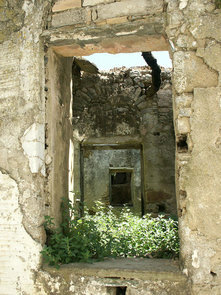 Kori tou Pyrgou: This is a small village which was, until recently, a ghost town. Today, at a slow pace, houses are being restored and the village becomes alive and colorful again. There are many legends regarding this place. According to one of them, in the spot where the village now lies was the tower of an exiled princess who spent her days weaving on her loom. 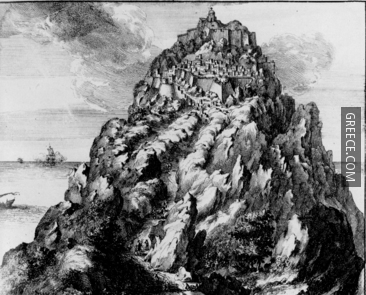 Aetofolia (=eagle’s nest): This village is built high up on the hill known as “Mountain of north Winds”. For many years, Aetofolia was the centre of Cycladic ceramic production and today efforts are being done to revive this handicraft. The thick vegetation in the area known as “Kannava” makes it one of the most unique spots on the whole island. Agapi: is one of the oldest villages on the island. It is built on a mountain slope and it is known for its characteristic paved roads, superb archways and traditional houses with their lovely lintels. Volax village: is located in a strange and unique site at an altitude of 280m. The landscape around the village is formed by hundreds of huge granite boulders, remains of a volcanic eruption that took place some thousands of years ago. Most of the houses in this small settlement date to the 18th century. Back then, the locals used those rocks to build their houses. Kolimpithra: Located 20km north of Hora, there is the bay of Kolimpithra. The bay has two beaches: Mikri and Megali Ammos. Both of the beaches have soft sand. Also, at Megali Ammos there is a small lagoon and at Mikri Ammos there is a small tavern and sunbeds. Livada Bay: is known for its natural beauty. The beach is filled with big pebbles which cover the seafloor too. Also there is a small river that flows into the sea. Next to Livada beach, there are two more beaches, Mavra Gremna and Koliotopos. Access to them is either on foot or by boat. Agios Giannis – Porto: This beach is southeast of Tinos town. It is a long sandy beach with shallow waters. On the beach, there are sunbeds, trees, taverns, hotels, cafes etc. Pahia Ammos: is an amazing beach with thin, golden sand and jade green waters. The beach is reachable either on foot or by car over a stretch of dirt road. Saint Phokas: is a beach close to the capital of the island (1.5km). It is a 2km long sandy beach, well organized, which offers various water sports. 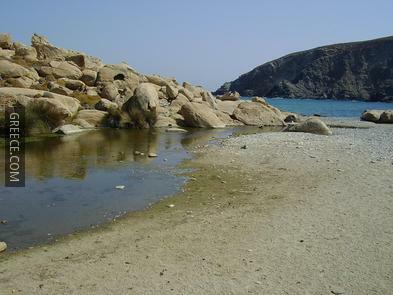 Agios Sostis: is one of the most popular beaches in Tinos. It has a mix of sand and pebbles. There is tourist infrastructure in the area with many rooms to rent, taverns, cafes, mini markets etc. Mali: is a small settlement situated by the sea. The beach in front of the village is sandy with few pebbles and trees. The peace and serenity of the place enchant visitors. The road to Mali is not particularly good, but the landscape along the way is amazing. Isternia: The beach of Isternia bay is a small sandy beach with trees offering shade. On the beach, you will also find a tavern and a few rooms for rent. Agios Romanos: is a wind-protected sandy beach with many trees along the shore. The beach is surrounded by a few summer country houses and has a tavern and rooms for rent. 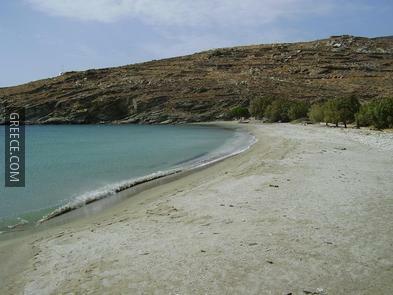 Giannaki Bay: the beach at Giannaki Bay is long and has a mix of sand and pebbles. The beach is well organized and has an amazing view of the island of Syros. 1. 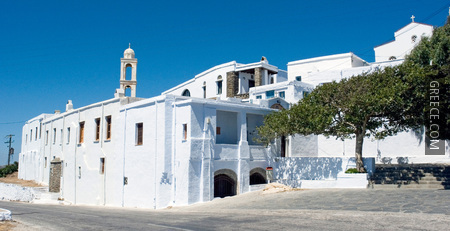 The church of Euagelismos Theotokou: Tinos is known as the “island of Virgin Mary”. It is without a doubt the most popular religious site for Greek Orthodox Christians. According to a local legend, during the 19th century, a nun had a dream in which Virgin Mary told her to search for an icon at a specific place and build a church in Her name. On 30 January 1833, the icon of Virgin Mary was actually found in the place where the nun said it would be. After that, all inhabitants, rich and poor, gave money and built the impressive church of the Annunciation on the same spot where the icon was found. So, every year, especially on and around 15 August, thousands of worshippers visit the Holy Temple of Virgin Mary. 2. The Archaeological Museum: The Museum is located on Megalocharis Avenue, opposite the OTE building, and it opened in 1963. The Museum houses finds from various areas of the island, such as a rich collection of coins, of which very few are on display, an interesting collection of vessels and household items, vases from the Early Geometric and Geometric periods and amphorae dating to the Archaic period. In the courtyard of the museum, there is a part of the frieze of the temple of Poseidon and Amphitrite, as well as the amazing mosaic floor found in the church of Panagia. 3. Temple of Poseidon: The temple is located in the area Kionia. During the 5th century B.C. the area flourished as a centre of worship of Poseidon. In the 3rd century B.C., the temple was reconstructed and expanded to include the worship of Amfirtiti, wife of Poseidon. Today, one can see parts of the foundation of the two temples, the guest house and the bath. Among the finds, you can see various sculptures and decorations of the temple, which bear witness to its magnificence. 4. Dovecots: Dovecots are monuments of unique artwork, built mainly during the 18th and 19th century. 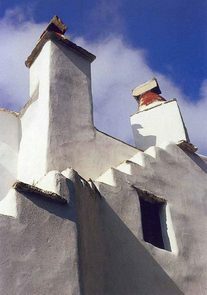 There are dovecots on several other islands of the Cyclades group. However, Tinos boasts the largest number and the most impressively decorated of them. Their exact number is not known, but the estimation is that they are more than 1,000. Most of them are located in the central part of the island and in Tarampados. They are mainly stone buildings of two floors. The lower floor is used as storage and the upper as dwelling of the doves. They are built at a particular angle towards the wind so that it can help takeoffs and landings of the doves. The inhabitants wanted the doves because of their tasty meat. 5. 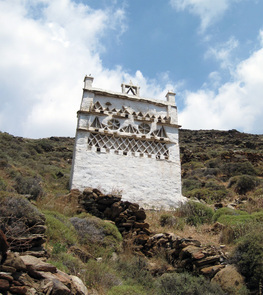 Trekking: There are several trails and footpaths all over Tinos for trekking and hiking fans. Most of the paths were opened during the years of agricultural development on the island. In the last years, the Ministry of the Aegean and local institutions cooperate in a project of restoration and signposting of trails. Today, 10 routes have been explored and officially established, covering a road network of 63km and spreading to almost every part of the island. 6. Monastiria village: It is an abandoned village, but the dilapidated residencies and the paved streets maintain their initial structure. 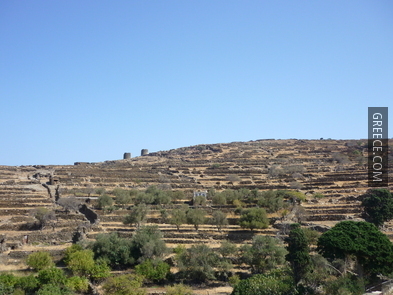 The village was built before 1600 and was completely abandoned several decades ago, because of the migration of its inhabitants to the main town of Tinos. The experience of a visit on this desolate village is unique and indescribable. Sea: There are daily ferries to Piraeus and the trip lasts six hours. Also there are daily ferries to Mykonos, Syros and Rafina. Weekly services go to Ikaria, Thessaloniki, Santorini, Paros, Iraklio on Crete and Amorgos. There are frequent buses from Tinos (Hora) to Kioni and several daily to Panormos via Pyrgos and Kampos. Buses leave from the station on the waterfront. You can find the timetable right next to the station. 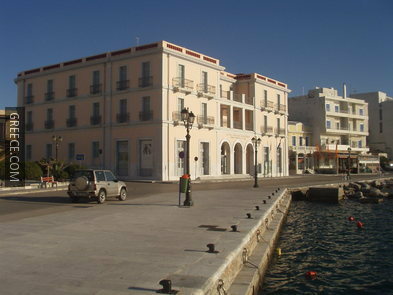 You can also Rent a Car in Tinos using Greece.com's Tinos Car Rental Engine. 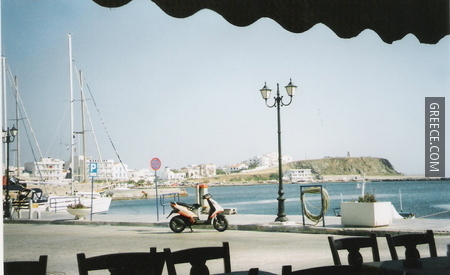 Tinos has a very nice climate, like most of the Cycladic Islands. It has a mild winter during which snow is very rare. 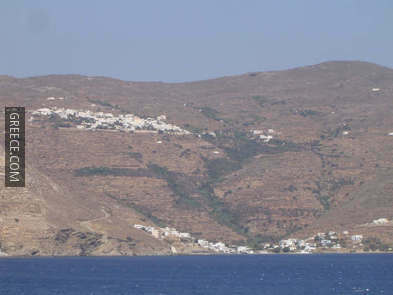 During summer, Tinos is hot, yet pleasant because of north winds called “meltemia”. The temperatures get quite low in the mountainous areas after sunset.